Where should I put my jewelry safe? Based on our professional experience and feedback from our customers, we suggest the safe be placed in an area where it can be conveniently accessed and easily used. The master bedroom, walk-in closet or dressing area are ideal locations because these are generally areas where you would dress and choose jewelry to enhance your ensemble. Hiding the safe in an inconvenient location, such as under the stairs, in a closet, or behind hanging clothes (so the bad guy can’t find it) will most likely prevent you from enjoying the advantages of having your valuables easily accessible to you, yet secure from potential theft. So, place the safe where you will use it. – you can also learn more about our luxury safes here. How do I design my jewelry safe? We’re always happy to help you with the design process over the phone or in person at our Southern California showroom. You can also request a Design Kit with samples of all the paints, woods and fabrics and a design booklet that will walk you through the process. What are your most popular safe configurations and how much do they cost? With so many options to choose from, we get this question all the time! To help make your decision making easier, we’ve put together our customers’ favorite safe configurations with pricing here. What does TL15 and TL30 High Security mean? Casoro has designed a line of High Security jewelry safes to meet the needs of our customers who have more demanding security requirements. Learn more about our TL15 Stealth and TL30 2-Hour Fire safes. Do you offer custom safes? Yes, generally all our safes are custom built for each individual order. We do try to keep some premade safes in stock for those who are in a hurry. Give us a call and we would be happy to speak to you about a custom or premade safe, 800.538.0600. What makes a luxury safe? Luxury is in the details. 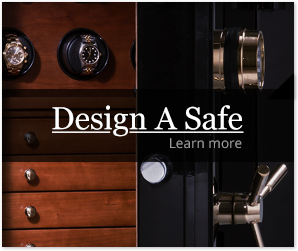 Each safe is built custom to order with close attention paid to every element. Learn more here. Does Casoro offer a Watch Safe? Yes, any Casoro safe can be an Ultimate Watch Safe. Our Kairos Collection has a particular focus on watch winders with the high tech, ultra-modern look many watch collectors appreciate. Our Gemstone Collection can also incorporate watch winders or drawers for watches. The maximum number of winders is determined by the size of the safe and the other elements you include inside your safe. To learn more about watch winders, visit our Watch Winder page. We are happy to consult with you on this by phone as well. Call us at 800.538.0600. If I have a home security system, do I really need a safe? Yes, your home security system will deter many burglars, but not all. The jewelry safe is your last line of defense. There are many instances of an intruder gaining entrance to a home, even when a security system is on site. You could forget to arm the system before going out, the electronics could malfunction, or the burglar may be able to defeat your security system. There is also the chance that you may let an individual into your home under false pretenses. Sadly, many jewelry losses are the result of theft by a person known to you (cleaning service, maintenance workers, or “friends”). We’ve heard these stories too many times in our store. A security system will generally not prevent theft in these circumstances. Therefore, your jewelry safe is well worth the one time investment to protect your valuables. If I have a sprinkler system do I really need a fire-resistant safe? A sprinkler system can provide protection from fire loss. But the protection of a fire-resistant jewelry safe can ensure that years’ worth of memories captured in special rings, necklaces, watches and other valuables will not be painfully lost. It is well worth the investment. How much fire protection do I need? The intensity and duration of a fire is dependent upon so many factors that it is impossible to predict how any one fire will behave. Even the firemen themselves disagree as to how much fire protection is needed. With over 21 years in the safe business, we are proud to offer Casoro safes, which carry the maximum fire safety rating available in the industry. Can my safe go upstairs? The two potential issues in placing a safe upstairs is the weight of the safe relative to the construction of the home and the size of the steps and landing, if there is one. Generally, safes less than 1,000 lbs. are fine on a second floor, assuming modern construction. As to the logistics of getting a safe up your stairs, it is helpful for us to know the size of the steps and the size and placement of a landing, if any. Having a photo of the pathway to the eventual location of the safe is also extremely helpful. Call us and we will be happy to discuss this with you. Isn’t it risky to buy a digital lock? The digital locks we put on our jewelry safes are U.L.-tested, Type 1 listed, extremely reliable high security locks. They have consistently been our most popular lock over the more than 20 years we have been in business, and we don’t expect that to change. The added convenience of quick entry, customized codes, which are easily changeable, and external access to batteries is much appreciated by our customers. The Casoro owners have had a digital lock safe in their home for over 14 years, and other than changing batteries every year or so, it has worked flawlessly. Why is my electronic lock not working? To help get your electronic lock up and running again, check out our Electronic Lock Troubleshooting Guide. Which lock is right for me? When it comes to locks, we get this question all the time: Which high security lock is the best: the mechanical, electronic keypad, or biometric? The answer is…Yes! All of these locks are superb choices, rated high security by Underwriter’s Laboratory (UL), and the most reliable of their types on the market. There are a few key differences however, which may help you decide, which lock is right for you. See more here. Can I change the combination for my safe? Yes, the combination can be changed – the question is who can do it? If you have a digital lock it is a simple process that you can do yourself. If you have a mechanical lock, a safe technician or locksmith will need to be called to change the combination for you. This is just one more reason why, by far, the majority of our customers choose the digital lock. How often do I need to change batteries on a digital lock? On average you can expect to change your lock batteries once a year. Many of our customers change their digital lock batteries once a year on the same cycle as they change their smoke detector batteries. The good news is that even if you forget and ignore the warning signal or if your batteries run down completely when the safe is locked, you still have access to the batteries from the outside of the safe. The lock will remember your custom combination. What happens if I lose or forget my combination? First, we highly recommend selecting an easy to remember combination. Something that is meaningful to you, other than the easily discoverable birth date, anniversary, street address, or phone number. Then as a backup, store your combination in a safe place or with someone you trust, though not in your safe. If for some reason you do lose track of your combination, it is possible that we may be able to retrieve it. Original combinations for mechanical locks that are installed on the safe at the factory, and reset codes for digital locks may be stored with the manufacturer by serial number. If you can document the serial number of your safe and, if it is a digital lock, the serial number inside the faceplate of the lock, give us a call. We will be happy to assist you. Where do I find operating instructions for my lock? ESL10XL – This digital lock has a “C” and a “#” symbol on the keypad. LaGard 3600 – This digital lock is used on the brushed chrome and oil rubbed bronze hardware. When should I use a dehumidifier with my safe? Safes that remain closed for an extended period of time or are located in humid conditions will benefit from a dehumidifier. There are a variety of types of dehumidifiers- electric, rechargeable and the familiar desiccant bag. These are inexpensive additions to your safe that can keep your valuables free of rust and mildew. How is shipping and delivery handled? You can choose between curbside and white glove delivery service. For our local customers, in Southern California, we have our own safe delivery and installation experts that consistently receive high praise for their outstanding service. Outside of our local area, we ship using one of a few select common carriers, either directly to you or to our partner in your area. If you have a locksmith or other service you trust that you would like to use to install your safe, the common carrier will deliver the safe curbside or in your garage, and your representative can take it from there. If you would like us to coordinate the installation, we will ship the safe to our associate in your area and they will complete the white glove delivery for us. How long will it take for me to get my jewelry safe? Each of our Casoro safes is custom made to your order and lead time from order to ship is 7 to 9 weeks for right door swing and 9 – 11 weeks for left door swing. We do try to keep parts of some of the most popular configurations in stock so if you need a quicker turnaround give us a call and we will discuss options to meet your timeline. Casoro Jewelry Safes are on display in our one and only Southern California showroom. We are conveniently located in Santa Ana, which is in central Orange County, just a short drive from Disneyland to the north, the mountains to the east and the beach to the west. If you live in the area you should come by and see us. The best way to appreciate the quality of our products and the sincerity of our customer service is in person. *If you’re interested in jewelry, geology, and other related topics, explore these educational resources.